materials from local family-owned businesses. We care about sustainability and we care about people. Here at County Line Mini Barns we take pride in the quality of our work. The standard mini barn is our most economical barn. The low side walls allow it to fit into areas where height is a concern. 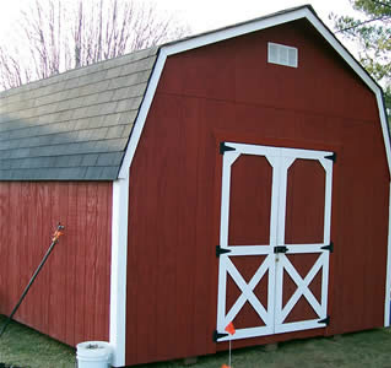 The medium and large barn style sheds have high side walls and can be ordered with a loft for your extra storage needs. "I'm not just happy, I'm EXTREMELY happy with this barn!" The high walls and basic roof line make this the perfect storage shed. With the double doors on the gable end it can look like a small garage. A great workshop, heavy duty storage or garden shed or combination of the two can simplify your life. This building has additional room for loft storage. Our Chicken Coops are custom built to meet your needs. They can have nesting boxes to collect from the outside or the inside, shutters to dress them up, a skylight to lengthen laying days, and any size to accommodate your flock. What would best meet your needs? We want to build that for you. We can work off a picture you might have, or an idea sketched out, or even just talking through your hopes and putting something together to fit your space. Every gardener's dream: storing your gardening supplies near the garden and reducing the steps back and forth from the garage. Organize your tools, include a workbench for potting, add some shelves and you have a little piece of pure delight. .Jon, thanks for the great design and quality workmanship. Everyone should have a County Line Mini-barn." Here is something to keep your children and grandchildren busy for hours! Make believe and play all day in a playhouse like this or one you design. Our playhouses also serve as good winter storage for yard ornaments. We often build them with a additional standard single entry door on the side or back for easy adult entrance and storage access. Here is a livestock shelter to load and deliver. It will get its corner trim on arrival. The center skids are for hauling and will be removed. All the lower boards are treated lumber and super heavy duty. A nice portable building to provide shelter for your cattle, horses, ponies, sheep, or goats. "Your workmanship is first-rate. completed. You were very courteous and answered our questions as you were building. Thank you!" Bring this to your yard and make a special place to relax and read or entertain your friends. We offer a screen package with a screen door as an option as well. 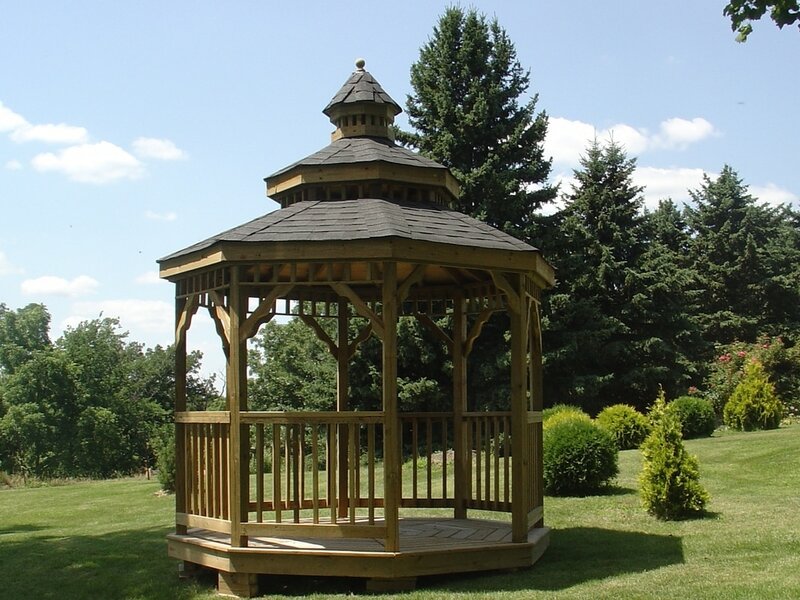 Our Gazebos are built with treated lumber and the ceiling is built with tongue and grove pine for a beautiful effect. ​​​​"The quality of your work is outstanding." Susan Olson, Reedsburg, WI"